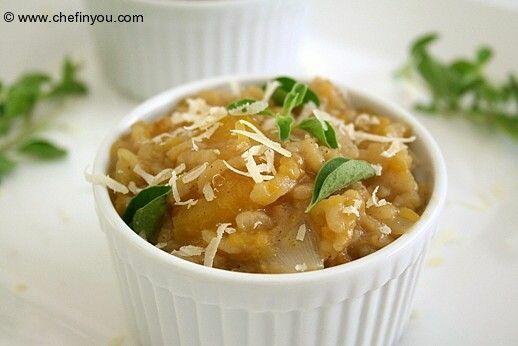 I don't think I would be too wrong in estimating that at least 95% of the people love risotto! I am a die hard fan. 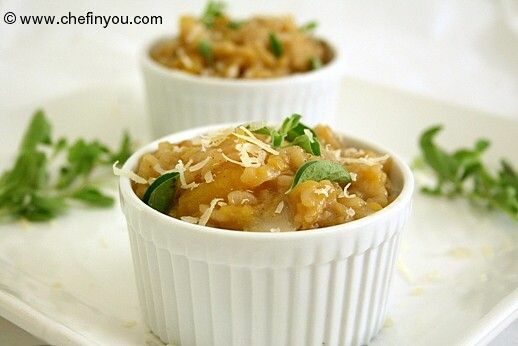 Give me mushroom, give me saffron or any other vegetable, I would first think of how I can make risotto with it. And with pumpkin season on, can it be left far behind? 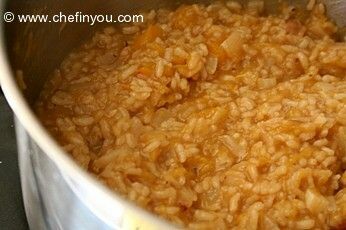 Its surprising that I have received 13 mails in the last 3 months asking me for a Risotto recipe made without using wine which plays an integral part in this dish - questions like 'Can you make risotto without wine?' or 'Do we have to have to change ingredients to make risotto without it'? 1. Heat the butter in a heavy-based pan. I know many recipes ask for at least 2-3 tbsp butter, but I find it works fine even with 1 tbsp. Otherwise, its get too rich for me. You can add an additional tbsp of butter according to your taste. Keep the heat low and let the butter melt and slowly brown. Unlike me, be close by, you don't want the butter burn. 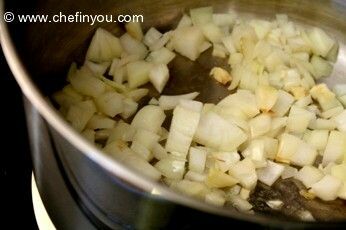 Now add the onions and saute it for few seconds. 2. 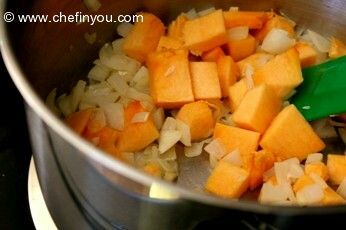 Now add the chopped pumpkins and saute along with salt for 1-2 minutes or until tender/soft. 4. 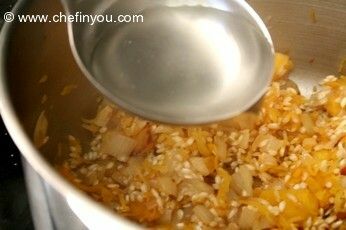 Next add the rice and toast it for 2-3 minutes or until the grains are translucent. 5. Alternatively, make sure you keep the vegetable stock/water simmering in another saucepan. You want it to be warm. 6. 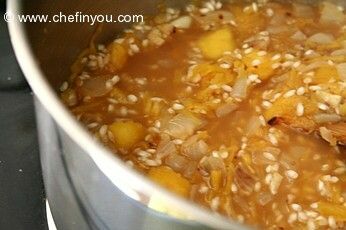 Now ladle in 1/2 cup of this warm stock to the rice and stir well. 7. 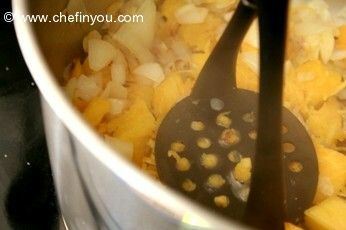 Add the stock little by little, stirring constantly for 15-20 minutes. 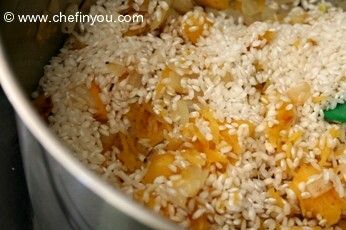 Add in more stock every time the rice absorbs the liquid. Add the pumpkin puree towards the end. 8. You know it is done when the rice is tender and very creamy. You might either need more stock or less from what is given in the requirement. 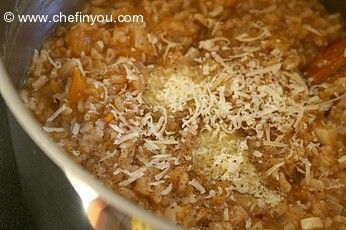 Remove from heat and add cheese, nutmeg and pepper. Fork the rice through - cover and leave it for few minutes before serving. And oh yes, don't forget to add more cheese :) You can use few sprigs of any of your favorite herb as garnish. Sorry, same question, how many servings for this? Thanks! 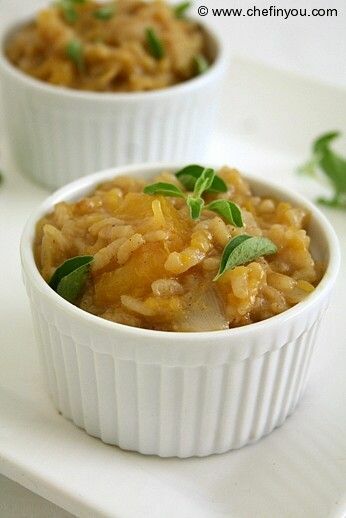 Pumkin risotto looks so delicious. So many delicious recipes here! 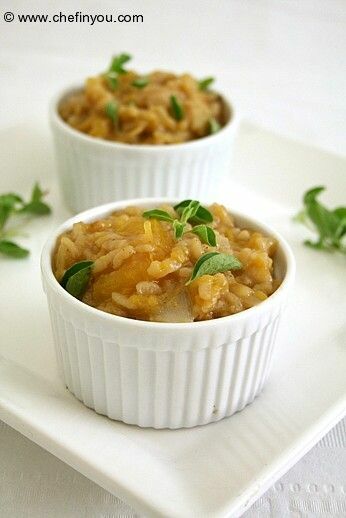 I and my hubby fall in love with Pumpkin and squash every Winter. Now we have another new recipe to try with the humble pumpkin. 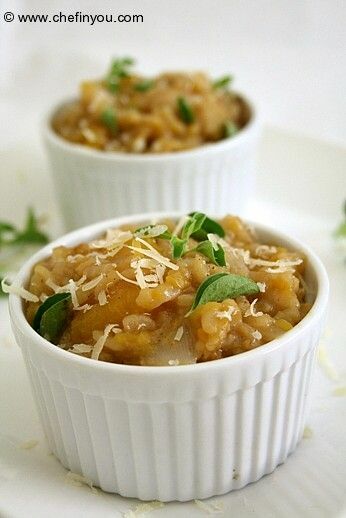 Dk, am awestuck to see this droolworthy dish with pumpkin..Just love this..